For the last 150 years people didn’t refer to amalgam fillings as amalgam fillings — simply because to them, they were the only fillings that they knew of. In the last couple of decades, innovative new filling compounds have been developed that are stronger and safer than traditional amalgam fillings. In fact, we urge all of our patients to get composite fillings instead of amalgam fillings. “So if there have been better filling materials in the last couple of decades, why do I have amalgam fillings?” is a common question that we get, here at Brightleaf Dental. Sure, safer filling technology has been around for a while, but like with most things, people are slow to change their ways. Some people continue to get amalgam fillings because it is the cheapest tooth filling material. Others continue to get amalgam fillings because they simply do not know that there are alternative options. But oh well, you already have the fillings. So there is not much you can do about it, right? Wrong. At Brightleaf Dental we offer our patients holistic amalgam filling removal and replacement services — so yes, you do have an option. Because we want you to make the switch back to a happier and healthier smile, we have listed some information on amalgam fillings, why they are an issue, and what the filling removal and replacement process looks like. Keep reading to learn more! First Thing’s First — What Is Amalgam? So we have already covered that amalgam is a material that is commonly used in fillings and that it contains mercury, but what else is there to it? Amalgam is a combination of various metals and has been one of the most common types of fillings for cavity repair for the last 150 years. Amalgam is commonly referred to as a “silver amalgam filling,” when in reality the world “silver” mostly refers to its color. While there are trace amounts of silver sometimes found in amalgam fillings, there is also an assortment of other metals including mercury, tin, and copper — as well as trace amounts of zinc, indium, and palladium. While amalgam fillings were the most common fillings used for the last century and a half, people have recently been ditching their metal fillings for more visually appealing materials that blend in with the color of the tooth. Why do people still commonly opt to have amalgam fillings? Amalgam, to this day, is still less costly than alternative fillings, in addition to being more efficient in withstanding wear and tear from chewing and biting. Because of the growing concern about the safety of amalgam fillings, millions of people have been asking “Are these fillings in my mouth safe?” As with most public safety concerns, the U.S. Food and Drug Administration (FDA) has been tasked with conducting research on the safety of amalgam fillings — the last of which was conducted in 2009. In the study conducted by the FDA, they concluded that amalgam fillings show minimal health risks to adults and children over the age of six years old. All that being said, mercury is a potentially harmful metal and many groups have asked the FDA to reconsider their findings or conduct new research. If mercury can be a harmful metal, why is it used in amalgam fillings? When it comes to amalgam fillings, mercury is the substance that makes everything work. When mixed with other alloys, mercury makes the material pliable — resulting in a compound that can be worked into the cavity, later hardening and cementing itself in place. What Is The Concern With Mercury Being In The Filling? While mercury is a metal that is found in nature, it can be harmful to your health. Mercury can become a gas when it is heated, falling to the earth once it cools and becomes semi-solid. Because of this, it can find its way to your body via food sources — later becoming built up internally against vital organs. All of that being said, it is hard for scientists to determine the amount of mercury that must accumulate in order to become dangerous, or how much mercury is absorbed and ingested as a result of having an amalgam filling. As we have already discussed, while not proven to be damaging, safe amalgam removal allows for the removal of a mercury source from your mouth, but the benefits of safe amalgam removal extend well beyond that. In addition to removing mercury from your mouth, safe amalgam removal can brighten your smile and strengthen your teeth. At Brightleaf Dental, we replace amalgam fillings with composite white fillings that not only match the color of the tooth and fill in the cavity left by the removed amalgam but also binds to the tooth, strengthening it and preventing future cracks. For a long time, people have thought of composite white fillings as having a purely aesthetic value, when in reality, there are many benefits. In addition to matching the color of the tooth and becoming less noticeable, composite white fillings bond tightly to the tooth and cavity surfaces. Once the cavity has been filled with the composite material and properly bonded, it will seal out all bacteria and provide structural support to the damaged tooth. If you are interested in replacing your old amalgam fillings with superior white composite fillings, we urge you to schedule an appointment with us at Brightleaf Dental. What Is The Safe Amalgam Removal Process? In terms of dental fillings and the safe amalgam removal process, the idea is generally pretty simple. It is our goal, as your experienced dentists office, to remove the potentially harmful amalgam fillings that you currently have and to replace them with superior white composite fillings. While the idea of safe amalgam removal is pretty straightforward, the process is a little more complex. If mercury can be a potential risk while your filling is in your tooth, it makes sense that there is a greater risk of mercury absorption when the amalgam filling is being removed. Because of this, there is a strict process that must be followed in order to consider the amalgam filling removal process as safe. Below, we have made a list of the steps that an experienced filling removal specialist, like ours at Brightleaf Dental, must execute to ensure that your amalgams fillings are removed safely. The first thing that is considered during the safe amalgam removal process is the temperature of the filling itself. When the filling is being drilled a large amount of heat is produced. While this heat might not be physically noticeable to you, it can be enough to affect the physical properties of the amalgam filling. Amalgam fillings are generally somewhere close to 50% mercury — meaning that the density of the filling can change quickly when exposed to low amounts of heat. If the filling is exposed to too much heat, the mercury can fracture into small particles, or even vaporize. By keeping the filling cool, the dental professional performing the procedure can ensure that the amalgam removal process is safe. Once a sufficient amount of drilling has been done, your mercury-safe dentist will begin chunking or cutting the amalgam filling into small parts. Chunking is an important part of the procedure because it allows the dentist to remove the amalgam without having to drill to dangerous depths that might affect other aspects of your dental health. The most important consideration during the chunking filling removal process is to ensure that none of the particles are lost. Thus being why step three is so important. 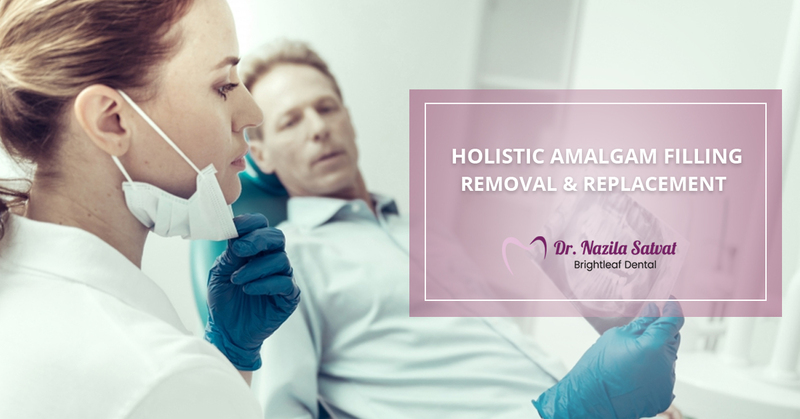 One of the most important aspects of filing removal, especially safe amalgam removal, is to ensure that the waste material from the extraction is adequately collected — ensuring that it is not absorbed or ingested. The best way to do so is to use a powerful suction system. When using a powerful suction system, the dentist performing the procedure can ensure that waste particles and vapor from the amalgam removal are collected. Being that particles and vapor from the amalgam filling can be present during the filling removal procedure, it is important to ensure that you, the patient, has an alternative source of air. Now, how that is done might vary, but what is important is that you do not breathe through your mouth. The most common way that this is done is for us to provide you with a nasal hood so that you can breather compressed air from a canister or air from outside the office. Once the amalgam filling has been removed from the tooth or teeth, it is time to begin the cleaning process to ensure that all of the mercury particles and vapor from the amalgam filling have been removed from the mouth. The first way that this is done is to clean the materials that have been used during the procedure. Often times, this involves the removal and changing of gloves that have been exposed, as well as the cleaning of tools that were used during the procedure. Once this is done, it is time for your mouth to be cleaned. The mouth cleaning that follows the filling removal process is similar to the cleaning that you might have received in your last scheduled cleaning. For 15-30 seconds, your mouth will be rinsed and suction will be applied until the dental team performing your filling removal thinks that your mouth has been sufficiently cleaned. Regardless of how well the amalgam filling removal has gone, some trace amounts of mercury will likely find its way into your system — but do not be alarmed. At Brightleaf Dental we practice holistic amalgam filling removal in an effort to ensure that whatever mercury finds its way into your system can still be expelled. There are many different approaches that can be taken towards the expulsion of mercury from your system. At Brightleaf Dental, we prefer to use chlorella. Chlorella is a single-cell freshwater alga that can aid your body in expelling mercury in a number of ways. The primary benefit of using chlorella in detoxing from mercury exposure is that it binds with the toxins from the filling removal and helps to carry them out of your body through the digestive system. Once we have removed your amalgam filling, we will give you a new filling using a more efficient white composite filling. At Brightleaf Dental, we prefer to give our patients composite white fillings not only because they are not made with mercury, but also because they match the color of your teeth and strengthen the damaged tooth by bonding with all of its surfaces. White composite fillings have a number of benefits, all of which you can learn about on our dental fillings page. The last, but certainly not least important, step to our amalgam filling removal process is to have you leave our office with a happy, healthy, and beautiful smile. At Brightleaf Dental it is our goal to provide you with the best dental experience possible — especially when it comes to safe amalgam removal. So what are you waiting for? It is time to lose those outdated amalgam fillings and upgrade them to a healthier, better looking, alternative. Come visit us today at Brightleaf Dental and take a step in the right direction towards a happer and healther mouth. If you are interested in getting rid of your old amalgam filling and trading them in for safer and stronger composite white fillings, we urge you to get in touch with us today to schedule an appointment. Do you still have questions about amalgam fillings and the amalgam filling process? Simply contact us today! Schedule An Amalgam Filling Removal Appointment Today!